This is the best cheap (economical) quality rubber training gun out there. 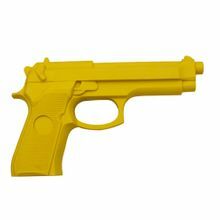 These dummy "guns" are solid blocks of expertly molded, brightly colored plastic or rubber-like material. They cannot fire or function as guns in any way other than described below. Weighted hard rubber fake gun cast from an actual automatic pistol for training to practice drills and takeaways in martial arts, krav maga, self defense class or holstering or any training routine to improve handling or defense. Amazing weapon detail down to the grip checkering and safety lever. The hard edges feel very much like the real thing. These dummy guns cannot shoot, but are very solid and will hurt if smacked with it. Looks like a Beretta or Taurus automatic pistol. Each weighs a little over 14 ounces and is 7.5 inches long. Just like the professional types you pay 5x more for. Also popular to use as prop gun or stage prop. So, if you need a rubber gun that is intrinsically safe (cannot be fired) and do not want to spend and arm and a leg, this is your best shot (so to speak). Black, yellow and orange colors now in stock. Now available is the Berreta 92 (or Taurus) model. It is also in yellow and weighs a hefty 18 ounces. This is a very solid replica manufactured with excellent detail for authenticity to make your training as effective as possible. There is no trigger in this model. There are no moving parts on any of these training pistols. Item has a good weight to it, very happy with it. Delivered what they said, when they said. It works. Excellent price.